Back in 2008, I decided to cross off a some of my bucket list items. First, I wanted to run a marathon. Secondly, I wanted to do an Ironman. And so I did. My first marathon was along the Atlantic shore here in Jacksonville as part of the “26.2 with Donna – the National Marathon to Finish Breast Cancer”. That particular race (which still runs every February) was a fantastic initial marathon. Pancake flat. A couple of miles on the beach. Great crowd support. Amazing women and men who had beat (or were in the process of beating) breast cancer. My finishing time was not great (and really isn’t important)…but I was successful in crossing that item off my list. Incidentally, back in 2010, I did a “Ten Questions With…” interview with Donna Deegan – the founder of the race. Click HERE to read that interview. Following that marathon experience, I signed up to race Ironman Kentucky, in Louisville. I was severely underprepared for that race. I tried to train without a real plan. I didn’t think that the hills would be all that rough. I didn’t devote as much time as I should have to training. As a result, the race was a disaster! I got into the swim expecting to have some downstream current. There wasn’t any. I sort of freaked out mid-swim and ended up having to do some backstroke and breaststroke. I finished the swim in close to 1:40 and then headed out on the bike. So….in case you were wondering….Louisville is NOT FLAT. I was seemingly going up or down the entire time. I tried to take my time and pace myself, but by the end of the bike, I was completely gassed. I started out on the run and very quickly determined that that leg of the race would be a combination of running and walking. By the time I got through 13 miles, it was more walking than anything. I made it through 18 miles and got pulled off the course. Upon returning to the transition area – completely devastated about my performance – I called home to speak with my wife. Believe it or not, she had already signed me up for Ironman Florida – in just about six weeks’ time! She really wanted me to cross off that bucket list item! And so, in November 2009, I toed the line in Panama City Beach for IMFL. The swim was much better than in Louisville – even despite the Gulf being seriously choppy. The bike was great – much more along the lines of what I was accustomed to. I did a modified Galloway approach on the run – running 3 or 5 minutes and then walking 1. And best of all, I finished! The time was not great (15 hours and change), but…..I FINISHED! Cross that baby off the list! Except that baby is back on my list again. See, for the last couple of years, I’ve been thinking about doing an iron distance race again. Sometimes when I’m in a rough spot on a run, I call up a mental picture of crossing the finish line at IMFL or remember that feeling of accomplishment. But, I’ve held off on actually doing another race. Things started to get serious last year – my friend and I were talking about doing a full. It was on his bucket list, after all. Plus, he wanted to do one before he turned 50, and time was running out. We had our eyes set on doing Beach to Battleship in November 2016. This Wilmington, NC, race had developed a fantastic reputation for being a super-high quality independent iron distance race. The price point was much lower than Ironman, the swim was current aided (and crazy fast), and the rest of the terrain was similar to northeast Florida. Plus, the November timing was perfect. And then, B2B decided to sell out to Ironman. While I certainly am open to racing an Ironman event, to me it was difficult to reconcile spending $300 or so more on race entry fees for substantially the same race – just because of a name change. Enter Rev3 Triathlon and their race at Cedar Point! See, I’ve been on the Rev3 age group team for a bunch of years, but have never raced at Cedar Point. Honestly, I’m not sure why – other than the fact that Sandusky, OH, is about 17 weeks away by car and not super-easy to fly to, either. I do love roller coasters, though, and by all accounts the course is quite similar to what I’m used to. So….Rev3 Cedar Point is now on my 2016 bucket list! The race is September 11th this year, and I’ll be ready to race. And this time, it’s not just about completing the distance and crossing off a bucket list item. This time, instead of “Complete an Ironman”, the bucket list item is “Race Rev3 Cedar Point”. There’s a real, tangible difference there. If you’ve raced a triathlon before, you know that USAT rules state that you cannot wear headsets, headphones, walkmans, iPods, mp3 players, or personal audio devices, etc. are not to be carried or worn at any time during the race. The penalty for doing so is a variable time penalty. And yet, if you’ve trained for a triathlon before, chances are that you have worn a headset, headphones, walkmans, iPod or MP3 player. Many folks run with music. Generally, it’s not a big deal. I often run with music. In fact, I find that my tempo sometimes increases or decreases depending on the song that I’m listening to. For example, it’s easier to run fast to “It’s the End of the World as We Know It” than “Tequila Sunrise”. I do enjoy running without music, though. It’s nice to listen to the ambient sounds, my impersonation of Darth Vader’s breathing, and such. Plus, it’s easier to have a quick chat with someone if you aren’t wearing earbuds. So…is it kosher to cycle wearing earbuds? It’s an interesting question – with potential legal guidance as well as common sense instruction. First, the common sense approach: Wisdom suggests that the wearing of earbuds limits our ability to hear sounds like a car approaching from behind, other cyclists, sirens, etc. Using common sense as the judge suggests that we probably shouldn’t wear earbuds – at least not in both ears – because it just isn’t safe. Moreover, it’s not a purists approach to cycling. Back in the day, cyclists didn’t wear headphones. They just had the wind and songbirds to listen to. And that guy behind you who always yells, “car back!”. Of course…back in the day, headphones didn’t exist. And, in any case…all those professionals that race in the Tour de France wear them, so it must be OK, right? So, discounting the common sense argument fully, it might not even be legal for you to wear headphones while cycling. That being said, even where there’s a statute about wearing headphones while operating a motor vehicle, there might be some wiggle room for interpretation. A strict reading of this statute might make you think that wearing a music player runs afoul of the law. But wait….almost everyone cycles with their phone these days. And isn’t it true that most people use their cell phone/device as both a phone and a music player? How would a police officer know if I was wearing an ear bud for phone call purposes or for music listening purposes? I guess that technically a police officer wouldn’t know the difference. 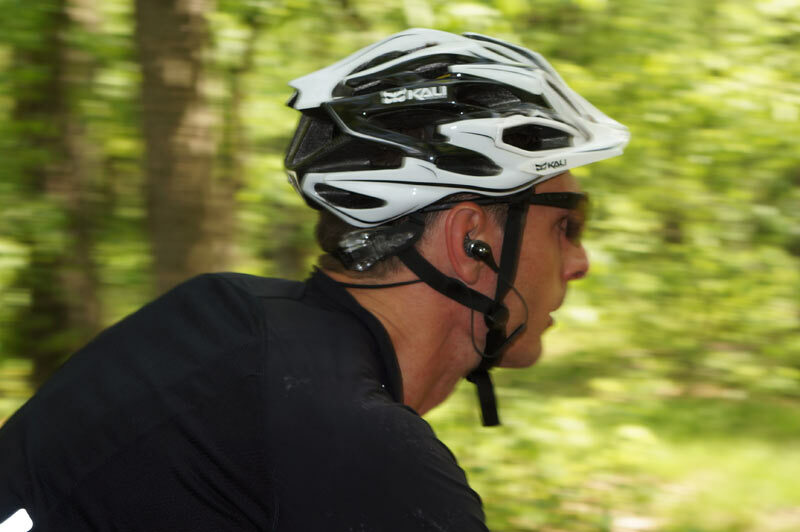 So, net/net – is it OK to wear earbuds while cycling? That’s a really interesting question – and I’m not about to give legal advice! I suggest that you learn and know the laws applicable to where you live and exercise at least a modicum of common sense. Truth be told, I wear one ear bud often when cycling. But only if I’m going alone and on a route that does not typically have much traffic. I always have the earbud in my right ear (facing away from traffic) so that I can better hear passing cars or other cyclists. When I do wear an ear bud, I don’t have my music so loud that I can’t hear other things. As an FYI, I found the infographic below this morning laying out the various state laws. I have absolutely no idea how accurate the information on here is, but it at least gives a starting perspective as to state statutes relating to wearing headphones or earbuds while operating a vehicle. Non-MDot Iron Races: Death Spiral?